Under the funding of the JR BIOTEK Foundation, Carlos Houdegbe and Dedeou Tchokponhoue, two members of the Laboratory of Genetics, Horticulture, and Seeds Science (GBioS) of the University of Abomey-Calavi (UAC) attended in Cambridge (UK) the second world-class Molecular Laboratory workshop organized by the Department of Plant Sciences of the University of Cambridge. 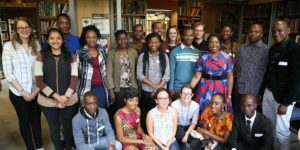 This was also an occasion for the two students, also members of the “Seed Service” start-up of the Laboratory of Genetics, Horticulture, and Seed Science (GBioS) of UAC to participate to the UK-Africa Food Security symposium, an interdisciplinary platform for knowledge exchange and strategic partnership development to address food insecurity in Africa. 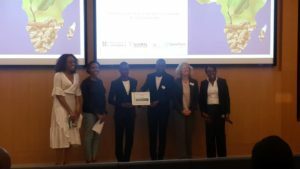 The “Bio-Innovation for Africa” pitching challenge was one of the most important attraction of this symposium; and this year’ competition brought together 11 contesting teams from six African nations: Nigeria, Ghana, Kenya, Ethiopia, and Zimbabwe, Benin. We are pleased to inform you that the “Seed Service” start-up of the Laboratory of Genetics, Horticulture, and Seed Science (Benin) through their Bio-Innovative product “Ecoseed” won the first prize of the competition: “the Most Promising Innovation Award”, followed by two Kenyan teams runner-up. The “Seed services” start-up provides smallholder farmers with quality and affordable seeds that are adapted to their local environment. Our products include among others the Amaranth, the basilic, and the eggplant. The Seed Services team is grateful to the JR Biotek Foundation for its financial support to attend the UK-Africa Food Security Symposium in UK.